Restructuring distressed hotels . . . hotel debt . . . and workouts of troubled hotel loans for profit opportunities now. Hotel lawyers on hotel turnarounds, workouts, restructurings, bankruptcies and opportunistic investment. JMBM’s hotel bankruptcy lawyers and hotel workout teams are getting busy as the fallout from the global economic crisis hits the hospitality industry. In addition to traditional bankruptcy, workouts, turnarounds and receivership, we are finding a lot of interest in JMBM’s SAVE® Program, and expect a big roll out in 2009. You may want to check that out! Otherwise, here is another useful tool for the SAVE® Program tool chest of techniques to help Lenders, Borrowers, and Investors with distressed hotel loans and hotel assets. We call it the Enhanced Note Sale™. The Enhanced Note Sale™ is the sale of a secured Promissory Note (secured by a troubled hotel) which is “enhanced” by a cooperative Borrower giving a deed-in-lieu of foreclosure to the Lender or a Buyer of the Note. The Note and security are left in place through a two-tiered subsidiary structure used by the Lender or Buyer, with title insurance endorsements to prevent merger of title when the affiliated parties acquire both the Note and related Mortgage or Trust Deed (by purchase from the Lender) and title to the property itself (by deed-in-lieu from the Borrower). The Note and security interest in the hotel are preserved to enable the Buyer of the Note to foreclose out junior liens and preserve a senior secured lien position in case the new owner of the hotel (the subsidiary entity) needs to deal with bankruptcy clean up or repositioning. (See JMBM’s SAVE® Program.) Here is how it works . . .
What are the Advantages to an Enhanced Note Sale™ transaction? How does the Enhanced Note Sale™ work? The “before” situation. The diagram below illustrates the typical lending relationship prior to an Enhanced Note Sale™. Initially, there is a Lender, a Borrower, and a Hotel (or other real estate collateral). 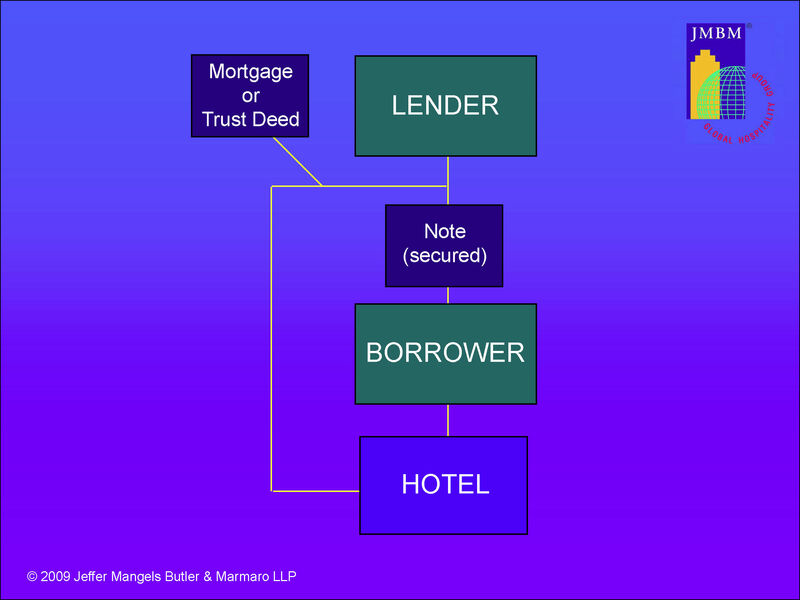 The Lender has lent money to the Borrower, taking back a Note and a security interest in the Hotel (evidenced by a Mortgage or Trust Deed). Then comes the Enhanced Note Sale™. The diagram below illustrates the essentials of the Enhanced Note Sale™ transaction. The key is a Master Agreement that coordinates and ties together all the parts of the transaction. JMBM has significant experience with these Master Agreements and can help any of the involved parties with negotiations and documentation. This transaction is a multi-party agreement with Lender, Borrower, Buyer, and Buyer’s subsidiary as parties — unlike a traditional deed-in-lieu transaction (with only Lender and Borrower as parties). Proceed directly with the Enhanced Note Sale™ transaction with a Buyer who has already been identified and is ready to purchase the Hotel. The parties to the Master Agreement include Lender, Borrower and Buyer. The Master Agreement is a critical document that must have a number of important provisions. Lender may use this opportunity to include certain releases and protections in favor of Lender. The Master Agreement should also set forth certain critical covenants, representations, warranties and indemnities that will flow from Borrower to Lender and also run independently from Borrower to Buyer. Pursuant to the Master Agreement, Lender will sell the Note and Mortgage or Trust Deed to Buyer, and Borrower will concurrently convey to Buyer’s wholly-owned subsidiary the title to the property by deed-in-lieu of foreclosure. Because a subsidiary takes title to the property (rather than the party that buys and owns the Note and Mortgage or Trust Deed), the estates are not merged, and the Buyer can later foreclose on the real property, if necessary, to extinguish junior liens and other junior interests. The “after” situation — when the Enhanced Note Sale™ is concluded. The diagram below shows parties’ positions after conclusion of the Enhanced Note Sale™ transaction. The Lender and the Borrower are no longer involved with the real property or the loan. Buyer now owns the Note and Mortgage or Trust Deed as a result of the purchase from Lender. The obligations on the Note have been assumed by Buyer’s wholly-owned subsidiary (as the successor owner of the Hotel). 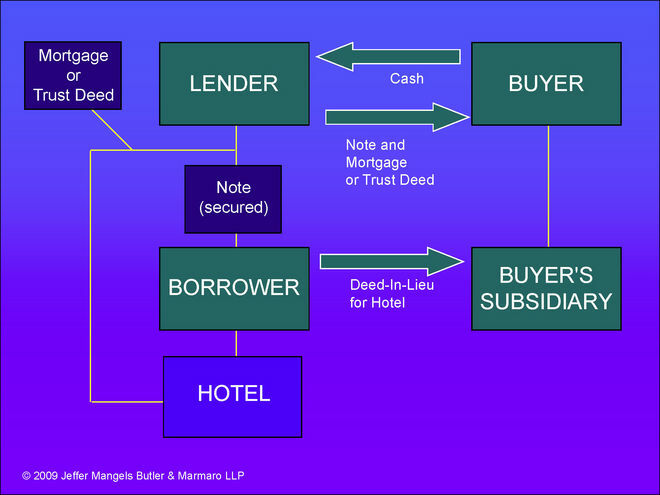 Buyer’s wholly owned subsidiary has obtained title to the Hotel by a deed-in-lieu from the original Borrower. Thus Buyer has obtained immediate control of the real property asset through deed-in-lieu from the original Borrower. 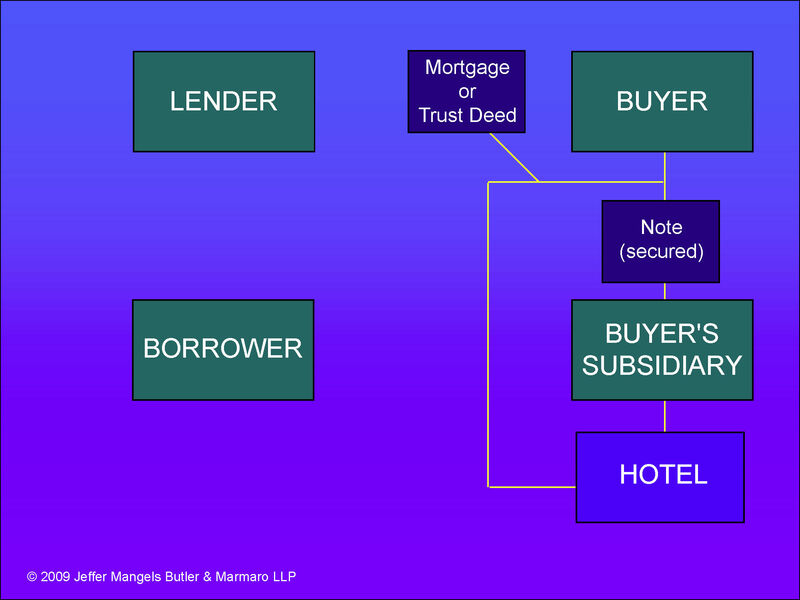 This transaction structure should eliminate a substantial part of the discount that a Buyer would otherwise require to buy a defaulted note as a result of Borrower’s representations and warranties and the cooperation of all parties in the transaction. The delays, expense and uncertainty of Borrower bankruptcy, or Borrower-related litigation and claims are eliminated. Meanwhile, the Lender avoids the delay, cost, regulatory and other problems involved in foreclosure, a deed-in-lieu and bankruptcy. With JMBM’s Enhanced Note Sale™, the Lender is also able to avoid making representations and warranties that it might have otherwise, because these representations come directly from the Borrower. And the Lender should not need to assume the risk of environmental and other liabilities that are incurred when taking title to real property. Lender can also sell the Note and Mortgage or Trust Deed without the usual heavy “discount” for a distressed note, because the Enhanced Note Sale™ structure avoids the risk of Borrower filing claims and proffering defenses to enforcement of the Promissory Note and taking title to the property. Meanwhile, Borrower avoids a foreclosure, antagonistic litigation with Lender, and maximizes the pay down to Lender (minimizing Borrower’s own continuing liability and possibly resulting in guaranty or other relief). The Enhanced Note Sale™ transaction will expand the universe of interested buyers willing to buy distressed Hotel debt, because the Buyer knows that at the conclusion of the transaction it will own the Hotel, the Note and the Mortgage or Trust Deed. Cooperation brings advantages for all parties in an Enhanced Note Sale™ transaction. We would be pleased to discuss how an Enhanced Note Sale™ transaction might work for you and other ways we might assist you in accomplishing your goals. JMBM helping create value with troubled Hotels. Straight talk and a pragmatic approach to enhance hospitality asset value with SAVE® and the Enhanced Note Sale™. If there is a way to enhance your Hotel’s value, creating a win-win for the Hotel Lender and Borrower, JMBM will find it. If there is not, we will tell you. Our goal is always to find alternatives to increase hotel asset value. We usually succeed.